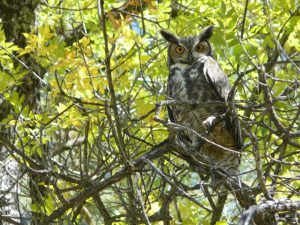 ← Reconnect with Nature at Casitas de Gila! Within every Natural landscape there are places that are so special that they are capable of creating a deep state of awareness, well being, or sometimes even transcendence, upon those who visit. Such places can range in scale from the grandiose, as in our National Parks, where visitors are typically awestruck by the magnificence of Nature before them. Or, they can be much smaller, often hidden, little places … places that are quickly passed through, completely unnoticed by the hurrying hiker, yet equally capable of instilling the same degree of an ineffable sense of well being to those who would stop and linger. Many of these special places in Nature possess an enchantment that is timeless, enduring for thousands of years. More typically, however, that specialness is much more ephemeral, sometimes lasting only a few moments at a certain time of day, perhaps sensed only during a certain season, or possibly lasting a few years before that elusive essence is gone. 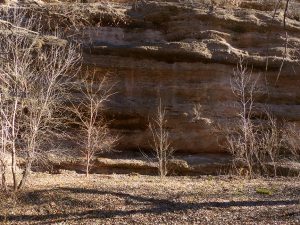 It was very late on a crystal clear afternoon in October of 1998, when we first viewed the magnificent landscape surrounding what would eventually become Casitas de Gila Guesthouses. Behind us, the setting Sun was already starting what we would soon come to call “the Magic Hour”: our daily yellow, to orange, to red, magic light show on the distant mountain ramparts of the Gila Wilderness to the north, the closer towering crags of Turtle Rock and the two smaller mountain peaks rising up from the east side of Bear Creek directly in front of the Casitas. Instantly, without speaking, we each knew that this was it: this was the Special Place in Nature that we had long envisioned and had been searching for. It was an emotional moment for both of us. We were home. From that moment almost 19 years ago, both we and our guests at Casitas de Gila have been privileged to enjoy this incredible New Mexican landscape that surrounds us, a unique landscape of mountains, rock, and sky, that changes dramatically in response to the daily and monthly cycling of the Sun and Moon, the Seasons, and the ever-changing weather. But while the distant view from the unique cliffside perch of the Casitas was spectacular from the beginning, the view down into Bear Creek canyon was not that special when we first arrived on Bear Creek. 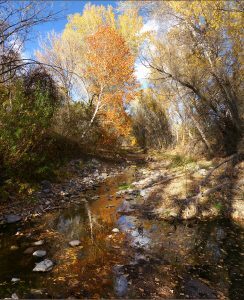 Of course any year-round running creek in high-desert Southern New Mexico can and should be considered special in its own right. 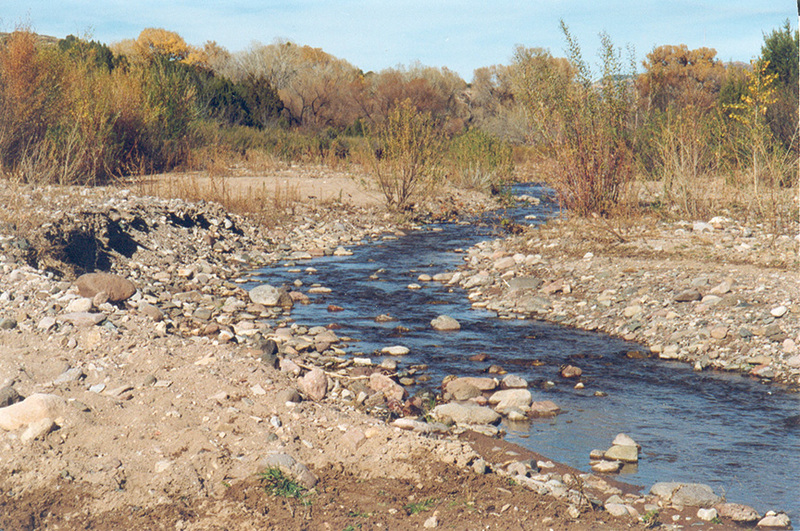 However, in 1999, when looking down into Bear Creek Canyon from the Casitas now under construction, what met the eye was a rather uninspiring, narrow rivulet of water winding its way south down a broad, featureless floodplain strewn with a chaotic jumble of grayish-tan boulders, gravel, and coarse sand, broken only by a scattering of logs and other vegetative debris left over from the last monsoonal flash flood in September. 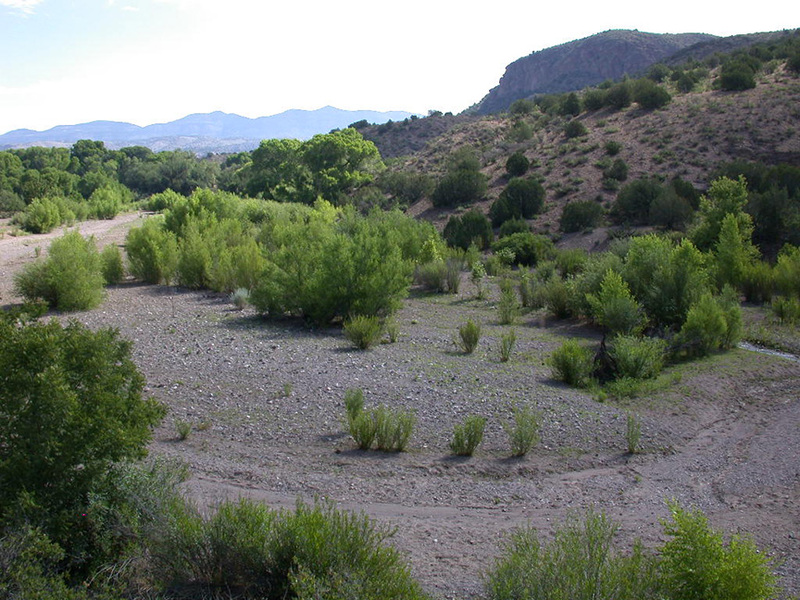 Other than a few old-growth cottonwoods and sycamores along its outer edge, there was not the expected growth of a diverse riverine forest across this floodplain, but only a few clumps of mostly less than head-high, flood-decimated vegetation. On initial hikes downstream along the Creek one observed that this riverine landscape showed all the signs of a creek and floodplain greatly out of natural equilibrium, apparently the result of an ongoing cycle of repeated major flash floods that had resulted in extensive erosion, scouring, and transitory channels that migrated back and forth across the entire floodplain due to the lack of vegetation. Why were there no actively growing stands of young trees and shrubs here on this floodplain, as commonly found elsewhere in the area? Was the Bear Creek drainage experiencing an unusual period of exceptional rainfall, or perhaps an increase in Summer Monsoon flash floods that had eroded and carried away all the normal floodplain vegetation? It would be a year or two before the answer to that question was fully understood by us, even though the answer was literally wandering around before our eyes from the the first moment we looked down on Bear Creek 80 feet below. The reason was cows, lots of cows, voracious cows, that seemed always hungry and constantly looking to devour any remaining green shoots of grass, weeds, willow, or cottonwood seedlings and just about any other plant that had managed to sprout within the floodplain since the last big flash flood. 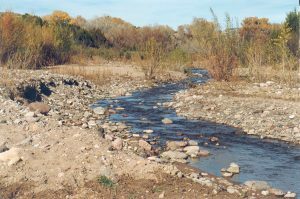 Gradually, over time, the simple answer became quite obvious: the barren boulder and gravel strewn floodplain in front of the Casitas was simply due to repetitive cycles of overgrazing by legions of voracious cattle following major flash floods! Construction of the Casitas began in February of 1999. By June two guesthouses were finished, allowing us to move onto the Casita property from the temporary quarters in Gila we had rented while our house and office were being finished. In addition to our dog, Gus, and our cat, Spota, both of which we had brought with us from Ireland, we also moved up our two horses, Saino and Yaqui, which we had acquired locally shortly after our purchase of the Casita property. We built a small corral down at the creek, and fenced off the north and south ends of our property to keep out the cows that had been invading from points upstream so our horses could enjoy the sparse amount of fresh green grass that remained on the floodplain, in addition to their regular rations of alfalfa hay. With the coming of Spring the following year, after fencing out the cows, we began to notice that that the remaining clumps of vegetation on the floodplain were enlarging. Nature was beginning to put the floodplain back in balance, and our two horses, try though they might, were simply unable to keep up with the massive and rapid growth of the vegetation that was taking place! 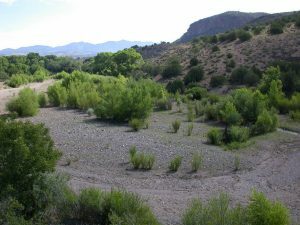 During the next two or three years after the Casitas opened, Bear Creek continued to migrate here and there across the floodplain, eventually coming to stabilize in a channel on the east side of the floodplain, at the foot of the mountains across from the Casitas. At the same time, and to our great delight, a scattered but promising stand of young cottonwoods, willows, and sycamores were taking root over the rest of the floodplain, greatly enhancing the view of Bear Creek from the Casitas. 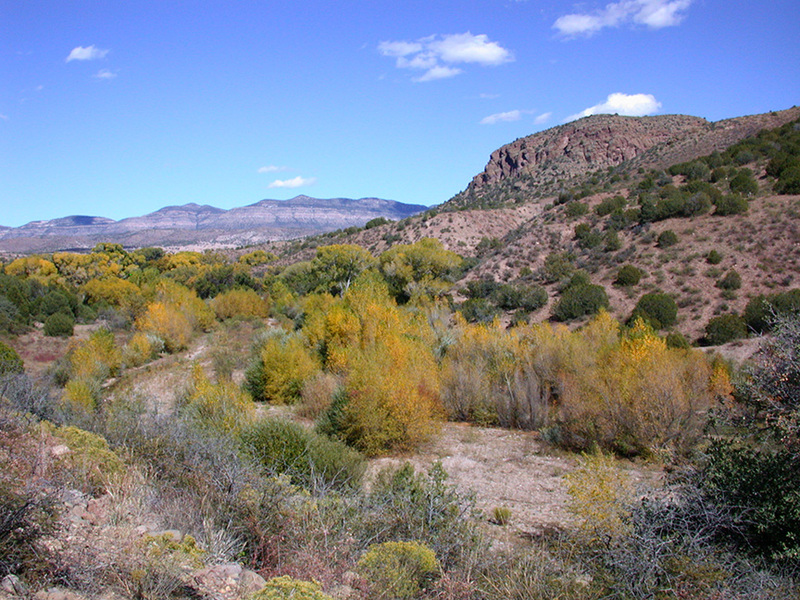 As the vegetation over the flood plain expanded and stabilized, The Casita Loop Trail, a half-mile Self-guided Nature Trail with a comprehensive printed guide, was completed in 2002, so our guests could discover, explore, and learn about the overall Natural History and various natural phenomena that were now taking place along the Creek. 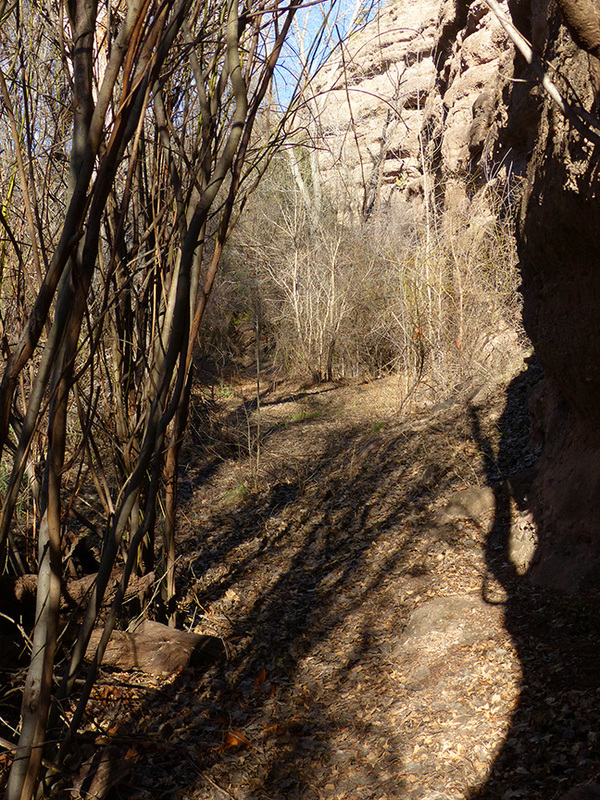 Starting and ending in front of the Casitas, the half-mile loop trail was constructed down the Gila Conglomerate cliffs on the west side of the canyon, where it would cross Bear Creek and then meander north upstream for a quarter of a mile through the floodplain forest, before crossing back over Bear Creek and climbing back up the cliffs to the starting point. 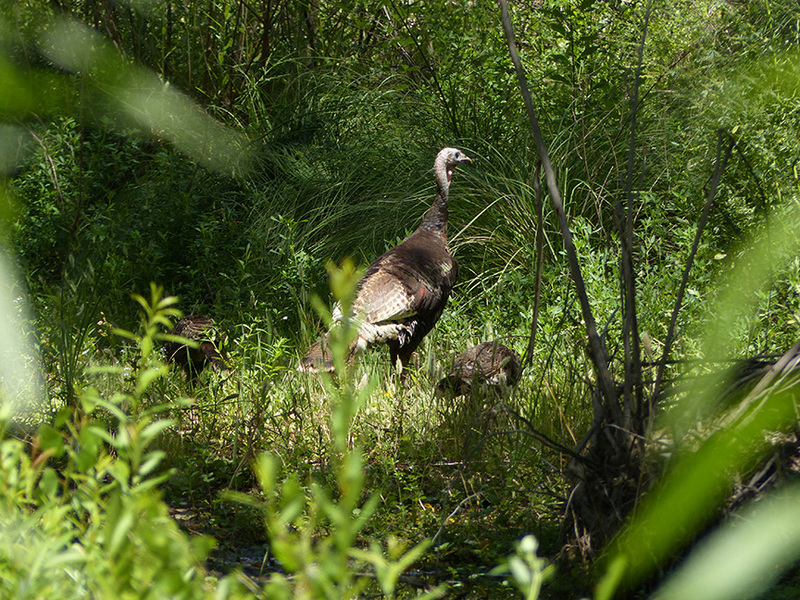 Thus, what we call the Casitas’ Bear Creek Nature Preserve was born, and what a Special Place it was becoming! 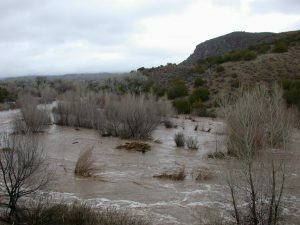 Then, in February 2005, a major three-day storm coming up from Mexico brought about three inches of rain over the entire Gila area, melting most of the Winter snow in the Gila Wilderness and causing major flooding on the Gila River and Bear Creek for almost two weeks. During this time the entire Bear Creek floodplain in front of the Casitas became one vast, 200-300 foot wide raging river, with depths peaking at eight feet above normal. Eventually, the flood waters did finally recede to reveal an unexpected surprise. Hidden beneath the turbulent waters of the flood, Mother Nature had certainly been very busy, for now the main channel of Bear Creek was found to be relocated 200 feet to the west on the Casita side of flood plain, somehow bypassing and leaving the young stand of young riverine forest in the middle of the floodplain essentially intact with little significant damage; a spatial rearrangement of Nature that has persisted up to the present. 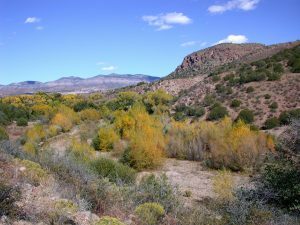 Between 2003 and 2010, Casitas de Gila Guesthouses acquired several additional parcels of land, greatly expanding the Bear Creek Nature Preserve from its original 71 acres and one-half mile of Bear Creek to 265 acres and three-quarters of a mile of Bear Creek, with over 5 miles of new trails on the property. 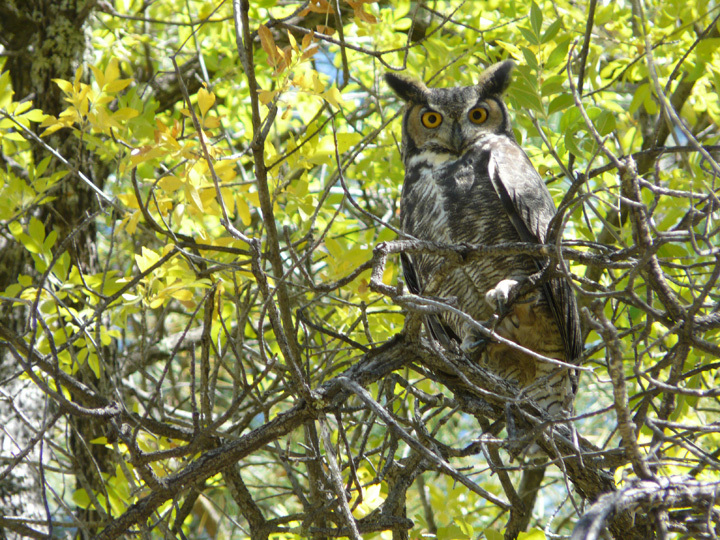 During this period of expansion and the following two or three years, out of necessity most of our attention was diverted from our original Bear Creek Nature Preserve to focus on acquiring and then learning about these new lands and habitats to determine how they could best be utilized and preserved for the benefit of both our visiting guests and the diverse variety of fauna and flora that lived there. 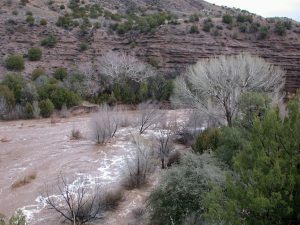 And during this time, pretty much unnoticed by us, the Bear Creek Nature Preserve matured: the young cottonwood, sycamore, ash, and walnut saplings became big trees, while an understory of highly-diverse species of shrubs, ground cover flora, and grasses spread across the floodplain, reestablishing a dynamic equilibrium with the periodic floods surging downstream. 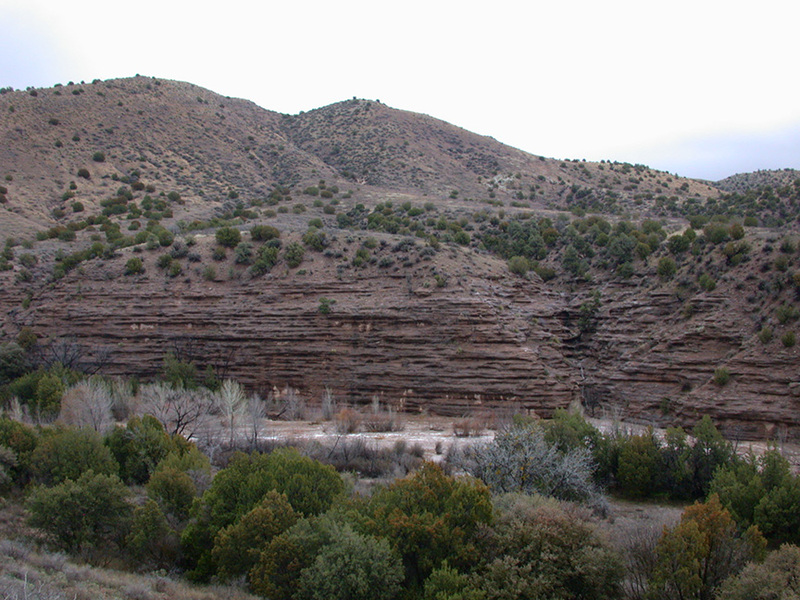 Towards the southern end of the Casitas property are massive, 120-foot high, vertical rock cliffs that form the east border of the Bear Creek floodplain. These cliffs are composed of a rock formation called the Gila Conglomerate which display layers upon layers of well-cemented, horizontally-bedded sedimentary rock comprised of silt, sand, coarse gravel, and large boulders of mostly volcanic material. Millions of years ago, ancient rivers flowing out of nearby volcanic mountains deposited and sequentially buried these layers of sediment. 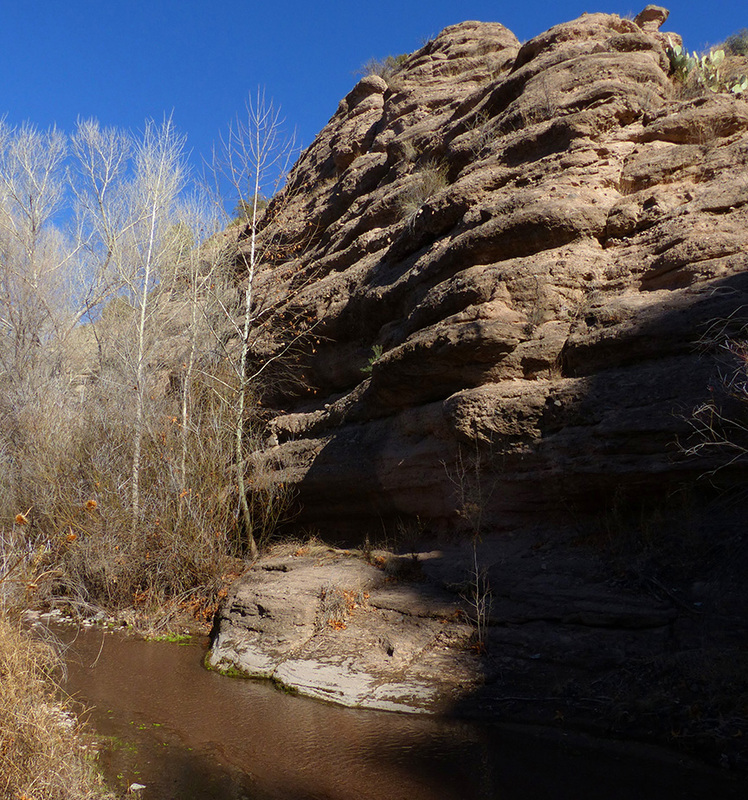 The thick sequence of Gila Conglomerate as seen in the cliffs today are the result of many thousands of years of erosion and downcutting action by Bear Creek. 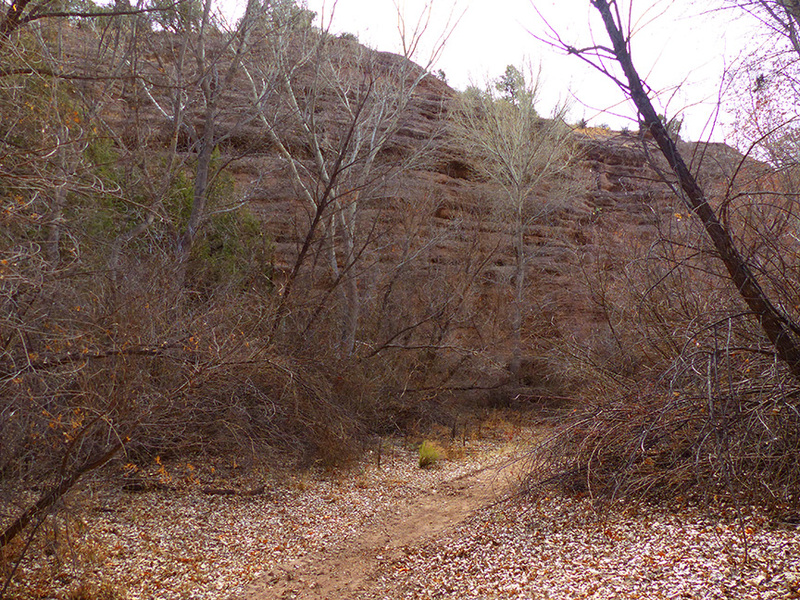 Prior to the 2005 flood, Bear Creek was flowing up against these cliffs, with the Self-guided Nature Trail located 150 feet to the west, running parallel to Bear Creek and cliffs. Then, during the 2005 flood as described above, Bear Creek relocated to the west side of the Canyon, putting the Nature Trail on the east side of the Creek just west of the cliffs. By Late Summer and Early Fall of 2005, a line of young cottonwood and sycamore shoots could be seen growing between Bear Creek and the Nature Trail to the east. At the same time, a rather continuous line of Bluestem Willow shoots began to grow along the east side of the Nature Trail. 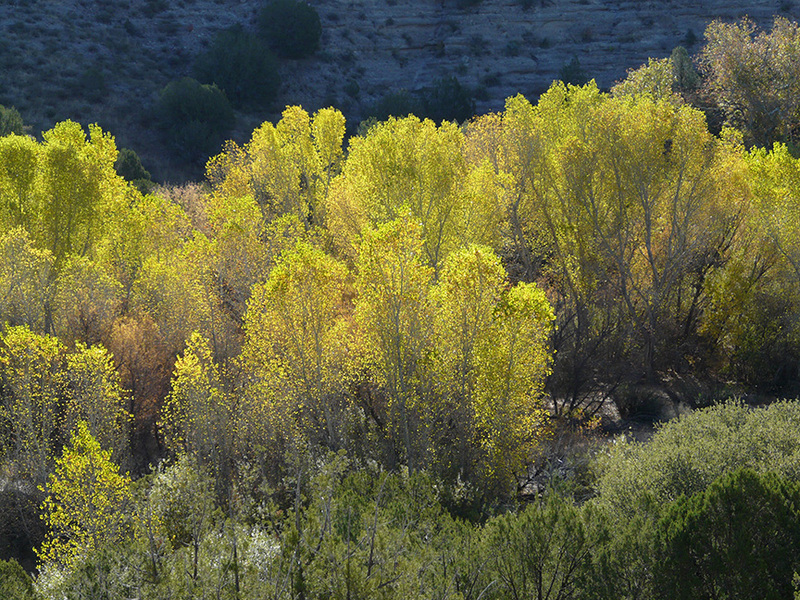 Further toward the cliffs, scattered shoots of young cottonwoods, sycamores, and Red Willows were also popping up. Mother Nature was wasting no time in reclaiming and revegetating the floodplain where Bear Creek had been flowing just a few months before. During the next nine years there were no major floods to change the course of Bear Creek or to disturb the gradually maturing riverine forest across the floodplain. As these years passed, one noticed how the view from the Casitas of the forest across the floodplain below was steadily increasing in grandeur, as the cycling of each season recast the floodplain from a ever-changing palette: from the somber blues, grays, and mauves of Winter, to the delicate yellow-greens of Spring, to the mysterious, deep, forest greens of Summer, to finally climax as a blazing ribbon of gold in the Fall. 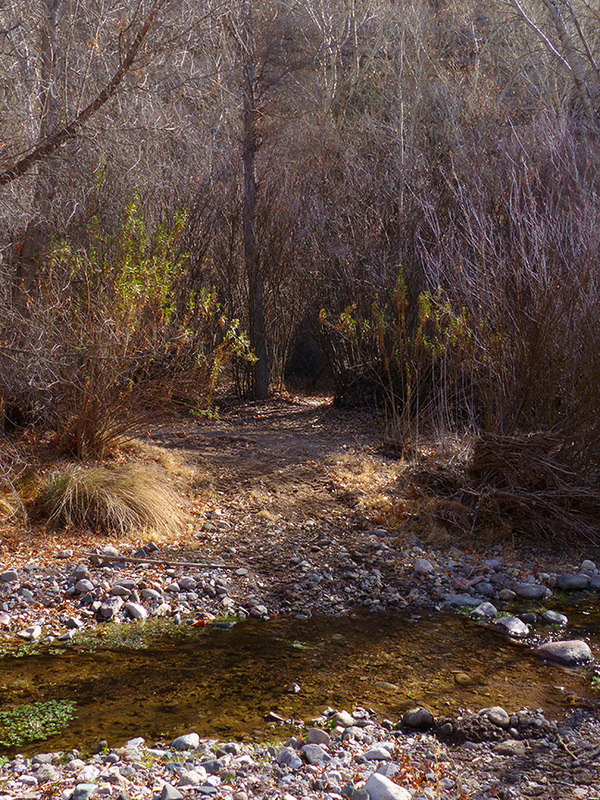 Trails in the Bear Creek floodplain require maintenance with the tractor at least two and sometimes three times a year. It was during the Summer of 2015, while doing trail maintenance across the Creek in front of the cliffs at one of the stops on the Self-guided Nature Trail, that one noticed how the line of Blue Stem Willows along the east side of the trail had grown into an impenetrable,15-20 foot high thicket that completely blocked the view of cliffs behind them; a view which was the subject of a lengthy discussion at that particular stop in the Nature Trail guide. Upon investigating, it was discovered that the problem might be easily solved by cutting an opening through the thicket into what appeared to be a small natural clearing just on the other side of the thicket. A narrow passageway, just wide enough for a person to squeeze through, was easily cut through the thicket. Passing through into the clearing one observed that the view once again matched the description in the Nature Trail guide: a spot where great views of the cliffs and the Big Horn Sheep that occasionally came to the cliffs, and the large variety of birds that frequented the area, would once again be available to guests using the Nature Trail guide. Upon entering the clearing for the first time, however, one immediately sensed that there was much more here than just the view of the cliffs. 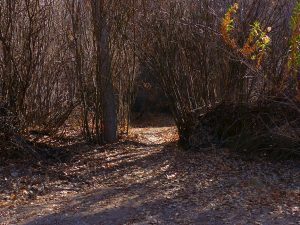 There was also an ineffable feeling of having just discovered of one of Nature’s Special Places, a place that up to that moment had been completely hidden from the world outside by the enclosing willows, young cottonwoods, and sycamores; a newly-created Special Little Place never before witnessed by a human being. Over the next two years, this Special Little Place became a favorite stop for guests walking the Self-guided Nature Trail, and a favorite haven for those seeking the deep solace and connection that only pristine Nature can provide. By late 2017, it was obvious that the cumulative effect of the many small, but constantly occurring, natural changes along the Self-guided Nature Trail since the 2005 flood had rendered the existing guide essentially useless. Javelina had eaten several of the cacti referenced in stops on the canyon side, while other referenced plants had simply died during droughty periods and vanished. Down in the floodplain, ground squirrels had taken away the orange tapes marking trail stops, either for making nests or perhaps just out of spite because of some innate, inexplicable dislike for neon orange. Also, with the culminating growth and maturing of the Bear Creek floodplain forest, Mother Nature had accomplished such a complete makeover that many of the stops as described in the guide bore little or no resemblance whatsoever to observed reality. It was time to bite the bullet. A comprehensive rewrite of the Nature Trail guide was long overdue. A new field study and evaluation of the entire Nature Trail was needed before the rewriting of the guide could begin. Immediately, it became obvious that this was not going to be an easy task. 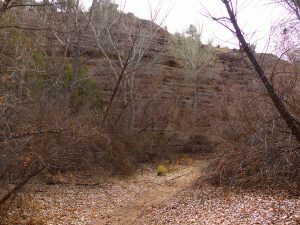 After a few days work, the field work for the rewrite had progressed to the other side of Bear Creek to the Marked Stop in the Nature Guide for the “Special Little Place” by the cliffs. 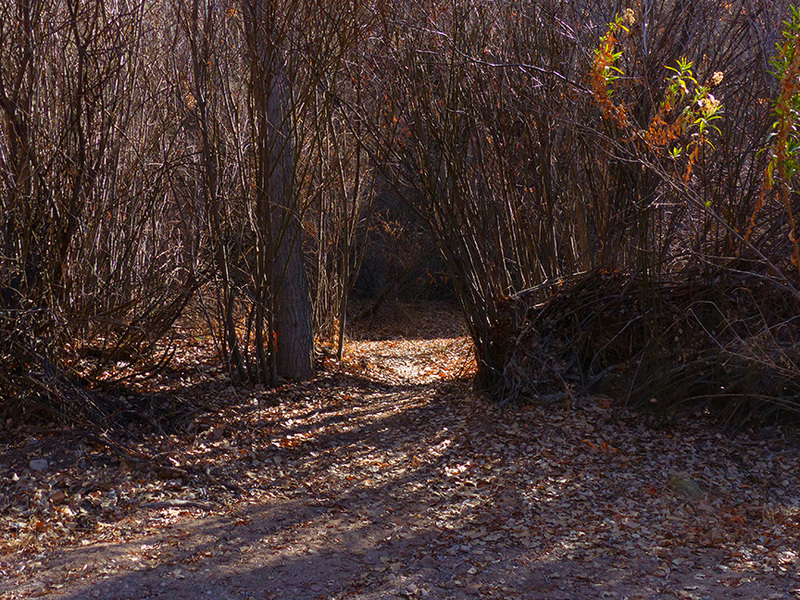 Stepping through the opening in the willow thicket into the clearing on the other side one realized that this was the first time that one had visited the little clearing in Winter. With all the leaves off the trees, closer examination of the clearing revealed that what up to that time had been considered a rather small clearing enclosed by dense vegetation was actually a series of elongated clearings that extended a couple of hundred feet to the south between the cliffs and Bear Creek before ending where the channel of the Creek shifted against the cliffs. Dense stands of young cottonwood, sycamore, and willow lined the west side of these clearings along the creek bank, and a scattering of tall trees and shrubs grew along the east side of the clearings up against the cliffs, creating a secluded sanctuary quite hidden from the rest of the Self-Guided Nature Trail. Intrigued by the uniqueness of this heretofore unknown and unexplored segment of the Bear Creek Nature Preserve, several more days were spent investigating the area. The studies confirmed that the area was so exceptional and special that a new trail should be established which could be included as an optional loop off of the old Self-guided Casita Loop Trail. The trail would be called the Cliffside Loop Trail. 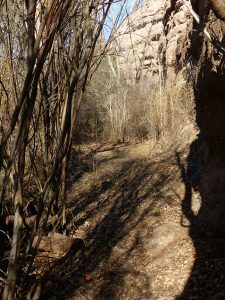 The Cliffside Loop Trail begins at and returns to the marker post at L6-5 on the Self-guided Casita Loop Trail and consists of three distinct sections. In the first section the trail begins by going south, downstream along the east bank of Bear Creek for about 230 feet, before heading away from the Creek to the base of the cliffs, where the second section begins. 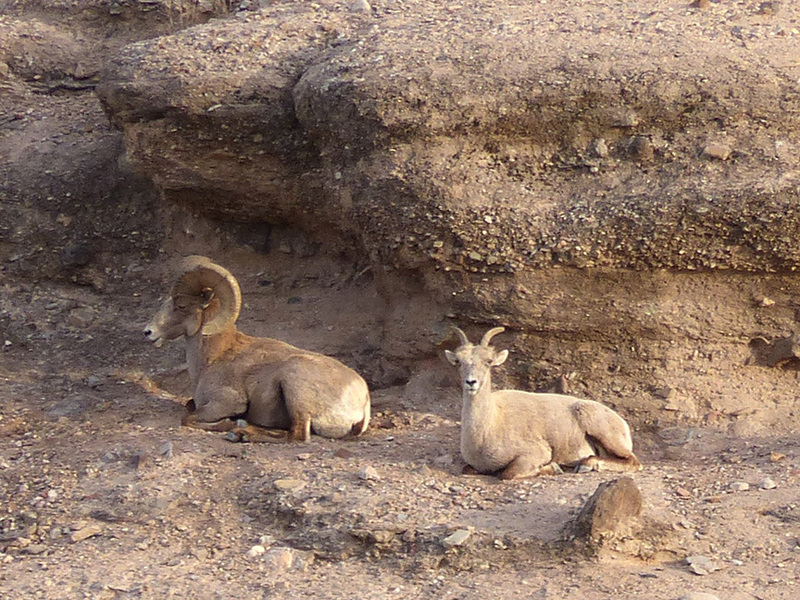 Rocky Mountain Bighorn Sheep on the cliffs above the Cliffside Loop Trail; these sheep have been coming to the cliffs here several times a year at unpredictable intervals for 19 years. 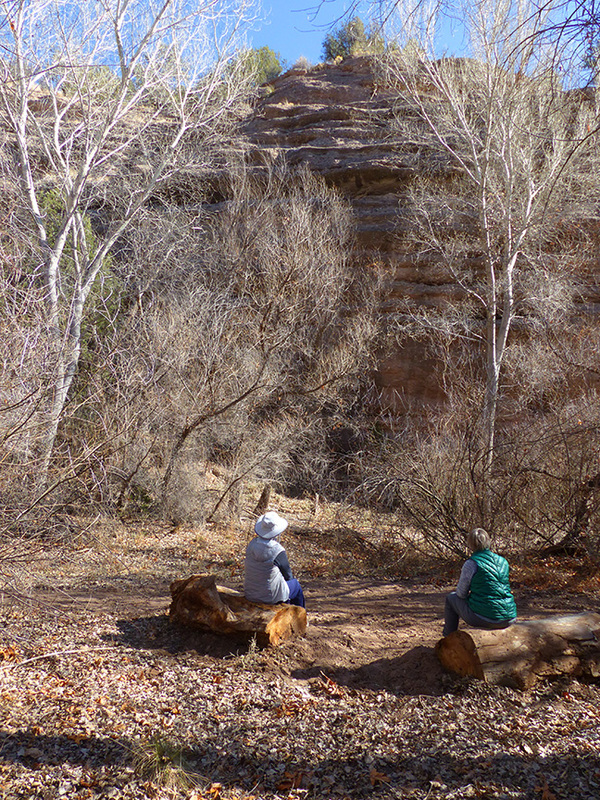 Along the first section of the trail several large cottonwood logs have been placed, allowing a guest to sit and relax in the special magic of the Bear Creek Nature Preserve. Here, one can watch for birds or animals, observe in detail the towering cliffs, or meditate in the silence of pristine Nature, a silence broken only by the rustle of the wind in the willows and cottonwoods above or the quiet murmur of the Creek nearby. The second section of the trail begins at the base of the cliffs, and proceeds 70 feet downstream, traversing a recessed cave-like passageway or alcove that has been cut back into a weak layer of the cliff face by the grinding action of the sediment-laden waters of Bear Creek acting over thousands of years. 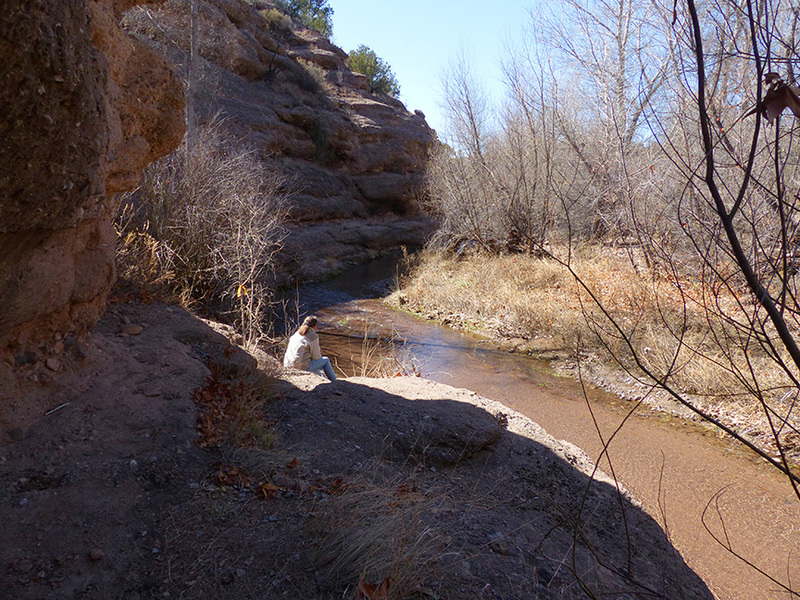 Stream-eroded cave-like features, such as this small one, can be found all along the Bear Creek drainage and the Gila River, with many of the larger ones having been used for human habitation for thousands of years, such as those found at the Gila Cliff Dwellings National Monument, some 25 miles northeast of the Casitas. 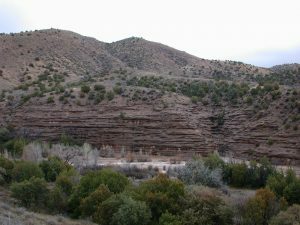 At the Gila Cliff Dwellings, members of the Native American Mogollon Culture in the late 13th Century built and lived in 40 rooms constructed of rock and adobe mud within 5 very large caves in Gila Conglomerate located up a side canyon on the West Fork of the Gila River. 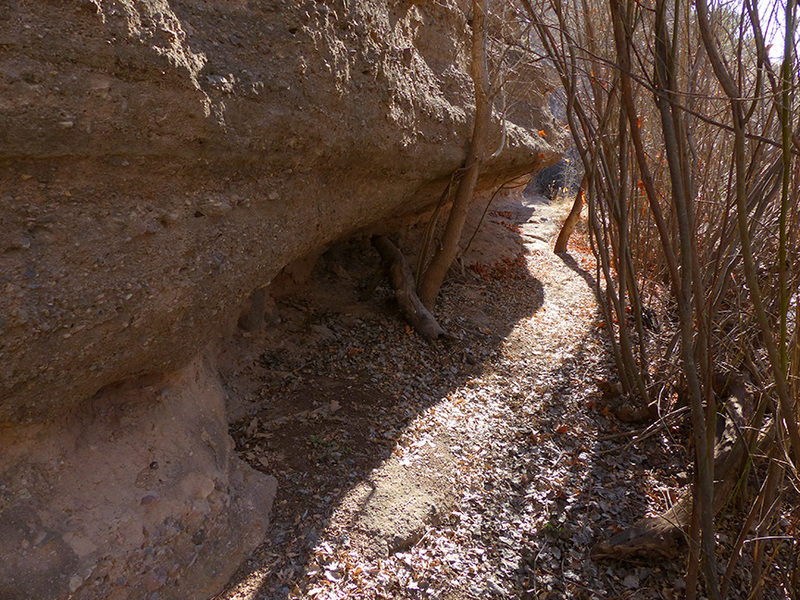 Although this small recessed alcove on Bear Creek is much too small for continuous human habitation, it has certainly been home to many animals over the years and probably provided an occasional overnight or temporary shelter to Native Americans waiting out a monsoonal thunderstorm as they travelled up Bear Creek. The second section of the trail ends at a flagged small tree growing on a rocky ledge that sticks out into the creek. 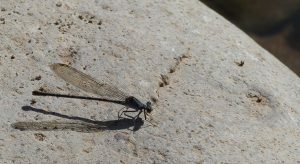 Here, during the warm months of the year, you will find a tranquil and delightful little spot were you can sit and peer down into the shallow, crystal clear waters of Bear Creek, watching the minnows dart up and down along the bottom, the water bugs skating on its surface, and the colorful dragonflies and damselflies patrolling the airways just above. From the end of the second section at the flagged tree on the rocky ledge, the trail is retraced back along the alcove to its beginning, where the third section begins. The third section of the trail heads north along the cliffs for approximately 250 feet, to end back at the marker post at L6-5. The trail in this section follows an elongated shallow trough or depression close to the cliffs that delineates the now-almost-filled former main channel of Bear Creek which flowed there prior to the 2005 flood. Over the first half of this third section of the trail one notices that the layers of conglomerate that make up the cliffs are exposed right to the ground level of the trail. Then, as one continues along the trail a point is reached where the exposed layers of rock in the cliff at ground level disappear behind a layer of soil and rock containing exposed roots and fallen trees that extends from ground level 6 or 7 feet up the side of the cliff. Continuing further along the trail, the horizontal thickness of this layer of soil and rock is observed to gradually widen so that mature trees can be seen growing on its upper surface. About here the origin of this soil and rock layer becomes apparent. What one has been observing is the eroded remnant of an old river terrace that bordered the rocky cliffs in times past, which was in the process of being eroded away before the flood of 2005 moved the stream channel to the west, away from the eroding cut bank. From this point the trail continues along the face of this old cut bank for another 100 feet or so before turning west to return to and end at Marker L6-5. 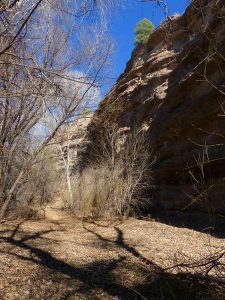 All of the field work, trail construction, trail photographs, and writing of this blog on the Cliffside Loop Trail was done between January 1 and and early March 2018. Throughout this time the landscape was still locked in drab Winter dress. 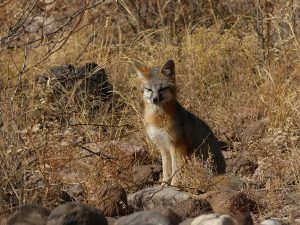 But then, right on schedule, on a short visit down to the Creek during the first week of March, one heard a new, but familiar, buzzing sound near the beginning of the Cliffside Trail. Tracing the sound quickly led one’s eyes upward to the highest branches of an especially tall Blue Stem Willow. There, caught in the first rays of morning Sun, were flowering catkins, offering a breakfast of the first nectar of Spring to an obviously delighted swarm of honey bees! Spring had sprung, and the greening of the Cliffside Loop Trail had begun. 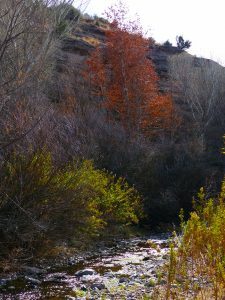 Heading back up to the Casitas, one smiled as he thought about the coming privilege of observing for the first time as Mother Nature cycled her ever-changing pallet of colors in this Special Place through Spring, Summer, and Fall. Most people when first visiting the Cliff Side Loop Trail will think that they have entered a Special Place that has been there for a very long time. But, as these writings have attempted to explain, this is not the case. This unique and special corner of the Bear Creek floodplain has only become so over the last three or four years, its evolving creation carefully hidden from view behind Mother Nature’s construction site screen of the towering willow thicket. How long will it be there for us to enjoy? Impossible to say. 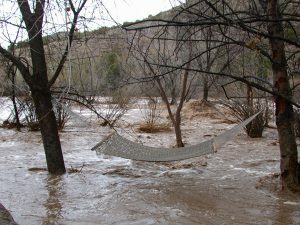 Could it be completely washed away this Summer during the 2018 Monsoon Season? Possibly. But considering the last 20 years of observed history, probably not. Next year? Possibly; but still probably not. Within a decade? Well, quite possibly; the odds are certainly increased. Will your great-grandchildren get to see it in the next century? Probably not! However, even if the Casitas are not here, they will still be able to enjoy during the Magic Hour from this Special Place the timeless view of the Gila Wilderness and Turtle Rock to the north and the two small mountains rising up from Bear Creek Nature Preserve below! Floodplains are a dynamic landscape of constant change. But, for the avid Seeker of Nature’s Special Places, it should now be an obvious comfort to know that hardly any Special Place is lost, without Mother Nature creating another … somewhere … Happy Seeking! 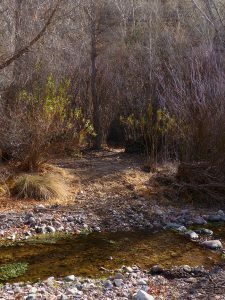 This entry was posted in Bear Creek, Casita trails, nature, nature preserve and tagged Bear Creek, hiking, nature, nature preserve. Bookmark the permalink.